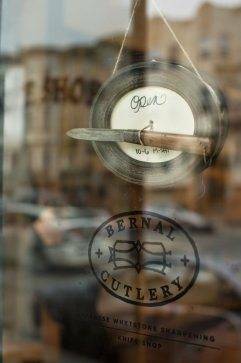 Here’s our interview with Josh Donald, owner of Bernal Cutlery, a sharpening business and knife shop based in San Francisco. 1. What’s the first knife that you sharpened in your life? First time I sharpened a knife that I remember I was around 8 years old and it was my Buck 110 with the tiny Arkansas stone and oil that it came with. I remember only getting one little spot on the blade sharper and it took a long time but I was hooked on the idea. I remember the smell of the oil and cutting my fingers holding onto that tiny stone. 2. How did you turn it into a business? How long have you been doing it for? 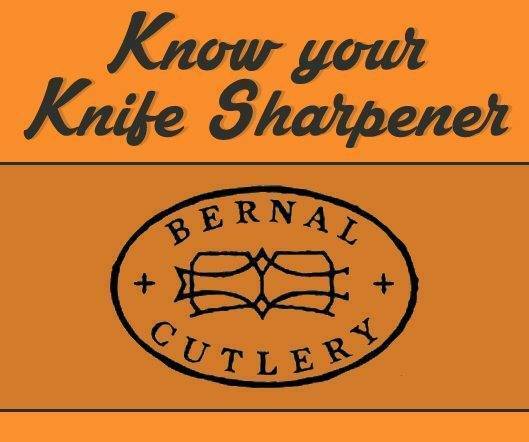 I began Bernal Cutlery as a sharpening service from my apartment in Bernal Heights San Francisco in 2005 when my first son was a baby. I was laid off and my wife was just starting to pick up freelance work so to make ends meet we put up some fliers in the neighborhood and I would pick up knives in the hood and sharpen them during my son’s naps. Shortly after that I began refurbishing vintage knives and selling them on eBay and around town to cooks. I started the business with $40 and a few Japanese stones that I had at the house. 3. Can you tell us more about your sharpening process? The core of my sharpening is done with synthetic Japanese whetstones, most knives that come into the shop are either super dull or sharpened at the wrong angle so they need to be re-beveled, this grinding work we typically do either with a Tormek or a Japanese horizontal waterstone wheel. If mechanical grinding is needed (it usually is as people don’t bring in their knives until long after they are really awful to use) then I follow it by going to 1000 or 2000 grit Japanese stones, 4000 to 8000 finishing stones and then a strop charged with chromium oxide to de-burr. Typically I finish around 6000 grit for Japanese knives but many non-Japanese knives get a coarser finish but for many really nice Japanese carbon steels I finish with a natural Japanese stone. I am experimenting with different finishes for non-Japanese knives right now, I am looking at bringing the cost down on lower quality knives with a different finish. I just started using a larger horizontal Japanese water wheel and am working out different combinations of stropping compounds and flat wheel grinds for non-Japanese knives. The Tormek has been the grinder that I have used for many years and while it is slow it is very controlled, it does leave too coarse of a grind to finish off of in my opinion. The work on stones by hand is done with the knife at approximately 45 degree angle to the stone with the bevel angle between 15 and 20 degrees (for most chef knives the spine sitting on the edge of 2 or 3 quarters), edge facing inward. There should be room for the hand holding the handle to move along the side of the stone but not so much of a right angle on the stone so that the elbow is sticking out too far. Work is done in a straight back and forth motion with a little bit of emphasis on the trailing stroke, knife should stay on the stone and two fingers from second hand are on the blade near the edge (not up on side of blade creating wobble) and these fingers on the blade should always be over the stone, never extending with the knife over the end of stone or to the side, nasty cuts are to be had doing that. Switch hands to work opposite side, use thumb, forefinger and middle finger of dominant hand together on the blade to push and control motion. If you are starting with a dull and damaged edge and are doing all work by hand use a coarse stone to remove metal along edge to create burr, using a medium grit stone for heavy removal takes too long and will increase the chances of having rounded off bevels. Go up to a medium stone to remove scratches from coarse stone and then going up to fine grit finishing stone to remove the medium grit scratches after that the strop with chromium oxide to remove any remaining burr. If the knife is not that dull at all, to keep it in good shape go straight to the finishing stone and strop. 4. How long did it take you to get really good at it? I think it took me several years to get good, I feel my work is still improving, getting consistent angles is difficult as is getting the angles correct. Getting a good geometry is super important, you can have a edge that shaves hair, cuts paper etc. and still doesn’t cut properly if the shape of the edge is off, a thick edge will mash onions whereas a thin one zips through without wedging and crushing with lateral wedging. Knowing what steels can go to is important as is getting to know different makers heat treatments, steel type and hardness are just a generalized view of what to expect, a so-so treatment of great steel is still so-so, a great treatment of a so-so steel can be great. 5. What was the first challenge back then? My first challenge was knowing what materials to use and when, I started pre-internet and without much money to throw at supplies, for years I had one Japanese stone that was a medium grit, I thought it didn’t work that well and went to diamond stones which produced a quicker rougher edge but in hindsight I didn’t have the coarse Japanese stone and fine stone to add to the medium stone. I use coarse diamond to flatten my Japanese stones now but find that the Japanese stones work faster and finish faster, diamond leaves a very deep scratch that is hard to work out. After figuring out what to materials to use, the main challenge of by working by hand is keeping an even angle and knowing what angle to work at, many beginning sharpeners start going at too steep of an angle as it’s faster to get an edge, but again the edge can be too thick, making for poor cutting. 6. Is it a good idea to start practicing with cheap knives? 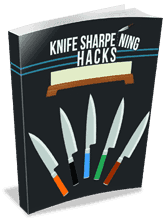 The idea that sharpening cheap knives is good for beginners is tempting as one doesn’t want to ‘ruin’ a good knife. However many cheap knives are hard to sharpen and if it has been sharpened down into the thicker part of the blade it can be super difficult. I do sharpening classes at the shop and many students show up with a 15 year old German knife to work on that has been ground in and they struggle with it. If one is going to start with cheap knives start with a thin blade that doesn’t have tons of metal to remove, many carbon steels are easier to work on, especially the last finishing process. 7. What’s the common mistake beginners make? I think the most common mistakes that new sharpeners make is first engaging in too much self doubt, second can be either being too cheap or too extravagant with their sharpening kit. For a Japanese stone set up $80-$120 is a good amount to get a basic kit. If one tries to use a cheap $10 stone results will be slow or non-existent. Also, realize that there are many ways to do it don’t try 12 different techniques all at once, keep it simple. Once you get good knowing when to stop and not overwork is important, many sharpeners that I have trained in my shop go through a learning sequence where they are not yet good, get better and then the quality falls off for a while once they know what to look for and get too fussy; overworking edges by ruining the geometry. However this usually is a fleeting phase, once they learn to trust their work and know what to look for the results shoot back up, I’m lucky to have some great sharpeners to work with. 8. Do you think you’re still improving your sharpening technique? I like to think that I am still improving, if I were to feel that I was done learning I would only have stopped being teachable. Using the knives that you sharpen and getting feedback from those that use them is invaluable. Even if someone is misusing their knives it is still a good indication of how the edges perform. Getting the feedback from the really skilled users is crucial though, there is only so much you can learn from those who stick their knives in dishwashers or use them for inappropriate tasks. I have been able to learn a lot about what works by providing edges on good knives for people who take their craft seriously. 9. What’s the most expensive or rare knife you’ve ever sharpened? Most expensive knife sharpened was a handmade Bob Kramer, I have no idea what it would fetch on the open market, it was used but still, what they sell for is legendary. The cook who uses it bought it many many years ago and its a work knife. 10. Which knives you hate to sharpen? I don’t like to sharpen knives for people who put them in the dishwasher or abuse them, it seems like a wasted effort to create a beautiful edge that will get treated like dirt, other than that there are several common stainless knives that I am not so fond of sharpening. Wear resistant stainless steels that don’t have a fine grain are not a sharpeners dream; subpar edges that are hard to work up are not gratifying. I love sharpening carbon and semi-stainless steels, a well forged and expertly heat treated carbon steel has no equal for sharpening.